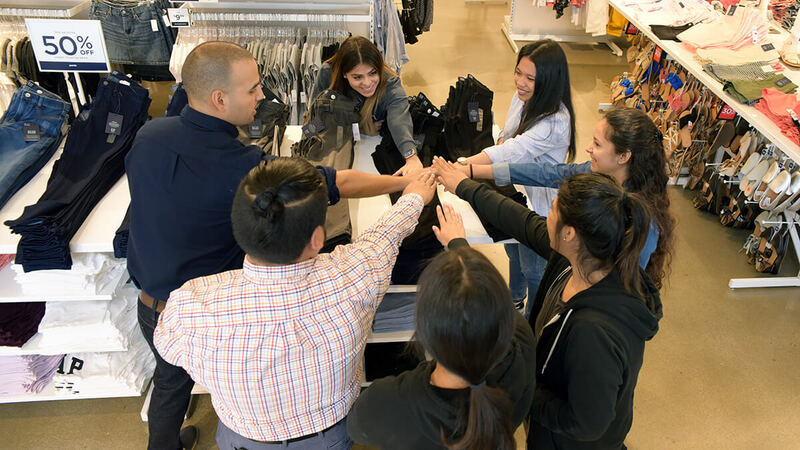 A Day in the Life of a Gap Factory General Manager, Who Started His Career as an Associate | Gap Inc.
It’s 7AM at the Gap Factory store in San Leandro, CA, where there are already smiling faces and impeccably organized stacks and racks of clothing. (You may not know it, but by the time your local Gap Factory store opens bright and early, the employees have already been there for a good three hours preparing the store to make sure it’s ready for all of your shopping needs.) 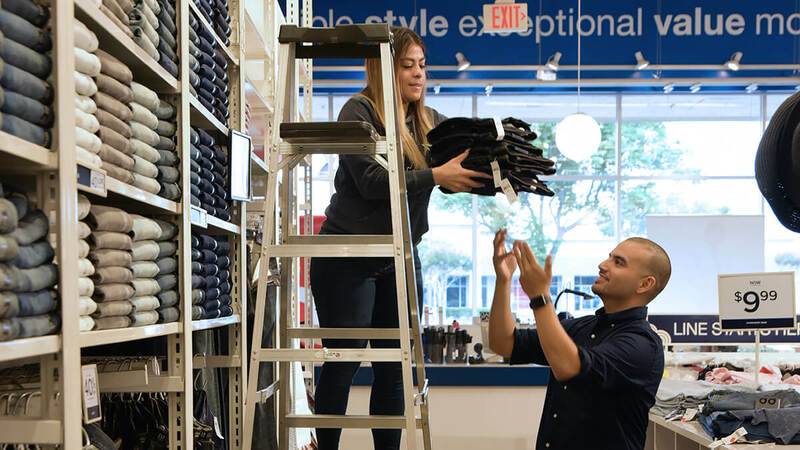 Early morning prep (pre-customer) includes everything from stacking and racking product, styling mannequins, and team huddles to get on the same page about the day’s goals, and talk about new store enhancements like the recently launched BRIGHT Rewards Program. So Juan, what’s your story? I was born and raised here in San Leandro and have a tremendous amount of pride in the community here, and the diversity of the Bay Area in general. I got my first job working part-time as a Seasonal Sales Associate at a Gap Factory store while I was still in college. I grew up wearing clothes from the whole family of Gap Inc. brands, including Gap and Old Navy. The store we’re in right now actually used to be an Old Navy store, complete with an Old Navy truck in the front of the store and one of those big dogs the brand used to have as its mascot! It was like a playground. I love the history of this particular store, and how it’s evolved to what we’ve built today as a Gap Factory. How did you work your way up from a Seasonal Sales Associate to a General Manager? It’s funny, I still remember my first day as a cashier because I was fumbling over my transactions left and right! I was so excited, but SO nervous! I opened my first Gap Card with a customer within my first week, and quickly became one of the higher credit producers in the store. I just had a knack for talking to people and understanding what their needs were, often without them even telling me. Soon enough, I was the highest credit producer in the region. But the thing that really helped me take it to the next level was the support I got from my manager. I worked closely with her to develop my skills as a leader and really get an understanding how the business works. That is honestly key to leading in any organization, no matter where you are. You’ve got to know the business. She chose to keep me on after the season ended, and I continued to grow from there. What exactly do you do as General Manager? It all starts with the customer and their shopping experience. When it comes down to it, without our customers, we wouldn’t have a store. We wouldn’t have a company. I try to manifest that belief in our customer by making sure our day-to-day operations and processes are working smoothly, and that our team is trained and developed to prioritize the customer. I try to instill that belief in my team as much as I can. But beyond that, it’s about making it fun. When I make this a fun place to work, that translates positively to everything we do. Our employees have a smile on their faces and the customers have a great time when they come in. And it keeps going from there. It’s a win-win for everyone! You sound very driven! Where does that passion come from? Definitely my family. It’s in my roots. My dad always encouraged me to work hard, do my best, and just stay motivated. That was never a question. I also think that since our store is in the Bay Area where the brand was founded, we have a responsibility to uphold the brand’s vision and pride. I truly believe that and that’s something I take really seriously. I get to meet so many different people. We get a lot of foot traffic from tourists coming to visit the Bay Area. One of my favorite things is getting to know them and understand what they’re looking for in their clothes, and how that might differ from our local customer. I also really love working with my team, and helping them be the best version of themselves. My managers spent a lot of time supporting my development, so I take a lot of pride in passing along that knowledge and developing the next generation of leaders. I truly believe it’s one of the hallmarks of a great leader: the willingness to help others lead. I still keep in touch with a lot of the team members that have left the company and gone onto other opportunities because the relationships you develop here are truly lasting. We really are a kind of family! I also love working with and around people that I’ve grown up around in this community. It’s a treat every day. I love our clothes! It’s that simple! Go through my closet and it’s all Gap. But more than the great clothes, I love the values that Gap holds true to in everything that we do, whether it’s the work we do giving back to communities or our stance on equality. This is also just such an incredible place to grow your career. So many opportunities have been available to me during my 10 years here at Gap, and I’ve been open to each of them. There are so many different paths to take at Gap Inc. I did a stretch project at a store in Las Vegas for a few weeks and another one at our flagship San Francisco Flood store. It was a privilege to have those opportunities at my fingertips, and I learned a ton. That’s honestly the best advice I would give anyone wanting to take their career to the next level. Be open to any and every opportunity that may come your way (and go looking for them, too!). You never know where one will take you, and what you’ll learn from it. Take feedback and apply it in the moment. Don’t wait a week to make it happen – do it today and you will be a stronger employee and person for it! 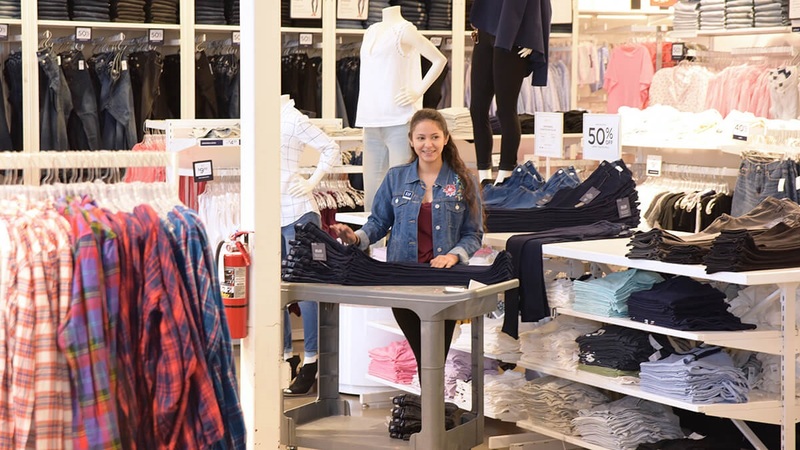 Are you interested in joining one of our awesome Gap store teams? Click here to see our open roles. And check us out on LinkedIn to stay in-the-know on company updates and new career opportunities.